Phil Nickell was born on his father's farm in the Land Between the Rivers of Western Kentucky on January 1, 1922, and grew up in Alton, Illinois. He took the FCC examinations and became a licensed Amateur Radio Operator at age 16. Three months before Pearl Harbor he enlisted in the Army Air Forces and entered air crew radio operator training. He was then retained as an instructor in that school. In mid-1943 Staff Sergeant Nickell was selected for the Aviation Cadet program at Yale University for training as a Communications Officer. He was commissioned a second lieutenant at Yale on June 22, 1944, where he was then retained to teach at the school until assignment to the 460th Heavy Bomb Group (B-24 Liberator aircraft) in Italy. 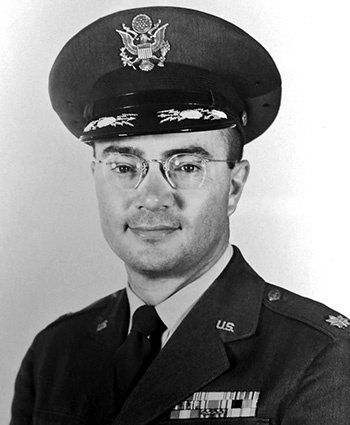 After the war, Lieutenant Nickell served a tour as Cryptographic Security Officer and Communications Officer for the 51st Fighter Wing at Naha AB, Okinawa, from 1948 to 1950, before being selected to go into the nuclear weapons program. The Cold War year's service 1952-1958 involved total immersion into the task of storage inspection, maintenance, and assembly of our stockpile of nuclear and thermo-nuclear weapons in support of war plans. Capt Nickell was in the forward trench of the Upshot-Knothole nuclear test in Nevada on March 17, 1953. Major Nickell's last major overseas assignment was from 1958-1960 as Staff Armament Officer for NATO's Allied Air Forces, Northern Europe, Oslo, Norway. He retired from the USAF on January 1, 1963. Following his USAF service Phil served in the Defense Department as a factory quality assurance representative for components of various space programs including Gemini, Viking, Minuteman, and the Space Shuttle.